Inkscape has the ability to convert bitmap images into paths via tracing. Inkscape uses routines from Potrace, with the generous permission of the author, Peter Selinger. 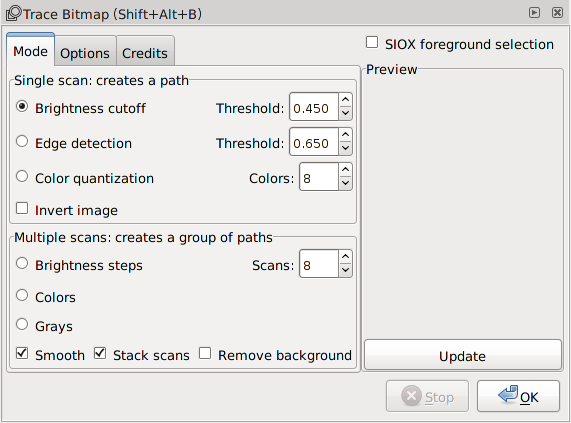 Optionally, SIOX can be used as a preprocessor to help separate a foreground from a background. Tracing an image is not an easy thing to do. Potrace works well for some types of artwork (black-and-white line drawing) and not so well for others (scans from screened color prints). The paths that are created can have thousands of nodes depending on the complexity of the image and may tax the power of your CPU. Using the Suppress speckles option can reduce the number of nodes generated by the scan. After the scan, you can use the Path → Simplify (Ctrl+L) command to reduce the number of nodes (but at a cost in resolution). In the latter case, careful tuning of the Simplification threshold under the Misc section of the Inkscape Preferences dialog may be necessary to obtain optimal results. The result of tracing depends heavily on the quality of the input images. Filtering input scans using Gimp (e.g., Gaussian blur) or mkbitmap may improve your results. To trace a bitmap, call up the Trace Bitmap dialog (Path → Trace Bitmap... (Shift+Alt+B)). The dialog has three tabs. The first is to select the tracing mode and the second has a list of options. Trace Bitmap dialog, Mode tab. Trace Bitmap dialog, Options tab. The Mode tab is divided into a number of parts. On the left are two sections: one for Single scans, where one Path is created, and one for Multiple scans, where several Paths are created. On the right is a Preview window, which can give you a quick idea of what the final scans will look like. A check box at the top right toggles on and off SIOX foreground selection (see below). A number of scanning strategies are available. Each is discussed in a following section. 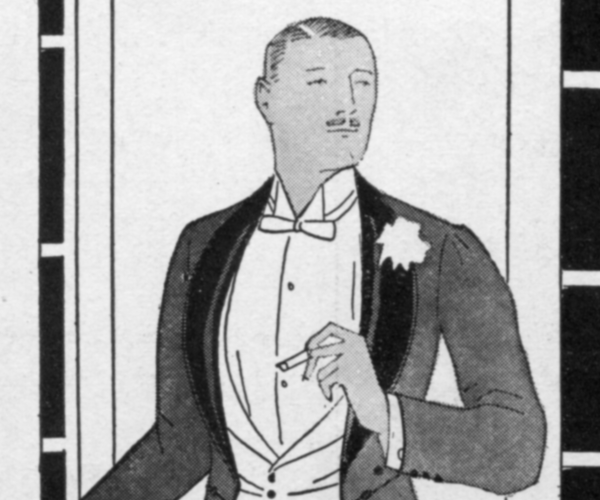 The sections show the results of tracing a black-and-white figure and a color figure. 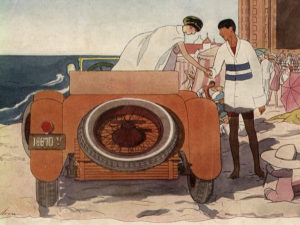 The input figures (from the August 1919 edition of Vanity Fair) are shown below. The scans have been passed through the Gimp Gaussian Blur filter to remove the effects of the printing screens. The following part of the chapter is divided into four parts. The first two cover Single Scans and Multiple Scans. The last two cover options that can be used both with Single Scans and with Multiple Scans.